Since New Leaf came out in summer 2013, I have been primarily focused on that game when it comes to playing Animal Crossing. Despite this, I never completely put down my Wild World game for good. It’s always been too tempting to pick it back up again every now and then, even if just to walk around town a bit and talk to neighbors, let a few days pass by, never doing anything too major. This was made possible and made all the more tempting because I left my town in a very pleasantly landscaped state, and I always recorded what date I left off on so I could load my game on that date and not have to deal with any unfortunate consequences (villagers leaving, flowers dying). Recently though, I did do some pretty big things in my Wild World town. Before I go into all that in my next post, I wanted to dedicate this post to the odd period, mostly 2014-2015, when I would pick up my game and play a little bit, not accomplishing much, mostly just taking pretty pictures and enjoying a visit to Dafdilly again. Some of these have already been posted to Tumblr, but I consider WordPress to be my more ‘archival’ type blog, so these pictures deserve a home here too. I loove how colorful this pansy field looks when few flowers are wilted! Some more shots from the moving start screen, a little blurry. Haha, this was no spontaneous WiFi shot >_> It’s an artificial photo shoot made possible by my multiple towns and DSes. But I just wanted a nice picnic shot, authentic or no. I love getting the clouds and the top of a landscape in the same picture, often happening on accident during a ‘inventory-window-shoots-bottom-screen-into-the-top-screen’ shot. Burned through some 99,000 bell bags to grow some more bell trees around Nookington’s (they didn’t all grow on the first try), but it was worth it 😛 If you’re wondering why I planted 99K bags, I think I read that the more bells you plant, the more likely it will grow into a bell tree. That could be wrong, though. For a villager I never planned on keeping for very long, Samson sure managed to stick around quite a while. I guess his house set-up by the beach was appealing enough to make him hard to let go (or easier to let go of other villagers first), but he is gone now finally. She had a gardening hobby at this point, I think (now she has a clothes-collecting one), which you can pick up in conversation like this, not just in actions like carrying around a watering can and planting flowers by her home. About a year ago I grew my very first home-grown-from-scratch blue rose in all my years of playing Animal Crossing! 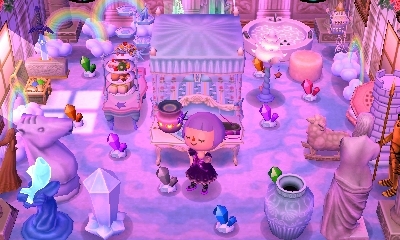 Again, about a year ago, I was inspired to re-do some of the rooms in my Wild World home, simply because I thought they could be a lot better than they were before. The main room just has to be this sort of cozy sweets/fairytale/toy cabin, it’s too steeped in Dafdilly tradition. Something I started to experiment with is still having rooms inspired by the tastes of my human characters, but not having all of them be bedrooms, just so that every single side room you go into isn’t a bedroom…a little much-needed variety. This is a fun, silly bathroom inspired by the tastes of my character Bell here. And this is a library/study inspired by Harmony’s tastes of calm and peaceful elegance. Lastly, a gardening/sun room. I really like the feel of this room, the wooden creaking as you walk around it, the way the sunlight at different times of day beautifully illuminates the room and flowers in unique ways. You may or may not have noticed there was no clear room made for my character Melody, who I decided long ago would be my sporty/outdoorsy character. Well, I’ve always been less enthusiastic about designing her rooms than my other characters (I’m not a particularly sporty person — mostly just like basketball), and her face design is one of my least favorites, so I decided that if I had to let one of my characters go into the void, it would be her. But I like to think that she just moved somewhere else, where she could run around freely without fearing trampling Twisk’s beloved flowers. Though there’s also another reason she had to go. Once I found out that plot resetting works in Wild World much the same as it does in New Leaf, the seed was planted in my mind, and it was only a matter of time before I embarked on mission to figure out what dream neighbors I wanted in Dafdilly and move them in — not just anywhere, but into the perfect places in town for their house & personality. It was a long process that involved finding out what every villager’s house shape is in the game, figuring out which house shapes match with which house styles in my town, deciding upon my dream neighbors based on a mixture of factors (how much I like them, having all the personalities, having nice house exteriors), and then deciding where my dream neighbors’ houses would be positioned in the various sign-posts/designated plots around town. Then I had to move some of my neighbors out and move them back into Dafdilly; reset an extra cartridge over and over for the dream neighbors I didn’t have, and move them into Dafdilly for the first time; plot resetting with every villager to get them to move in where I wanted them to. 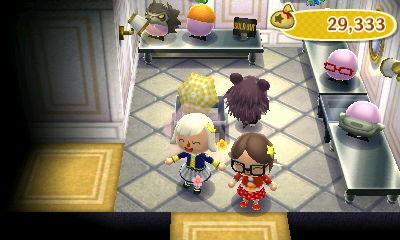 And I did eventually accomplish this, plus lock all of my new dream villagers in town so that they will never move! I’ll share who they all are, where they live, and who the new human resident of Dafdilly is, in my next post, which will also have pictures of my re-decorations for the cherry blossom festival. Posted on June 30, 2016 by Amy •	This entry was posted in AC:WW, Dafdilly and tagged Animal Crossing. Bookmark the permalink. your town is real cute! town is cute as hell! At least with the plot resetting in Wild World, you KNOW the areas already it’ll choose because of signs, but New Leaf literally puts them in the most random areas it can generate! 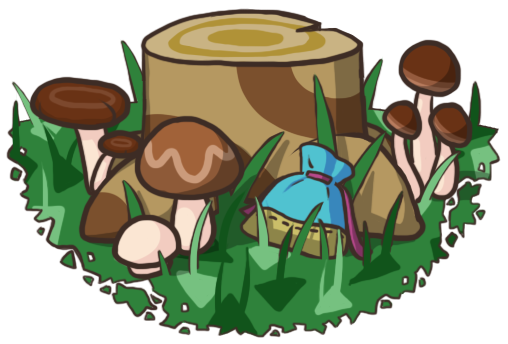 Hopefully the signs return, that way you can make paths, and never worry about them being taken by a villager!